From its origins at the turn of the 20th century as the Scripps Institution of Oceanography, the University of California, San Diego (UCSD) has grown into a public research university sprawling across 2,000 acres near the Southern California coast. It offers more than 200 undergraduate and graduate degree programs to 22,700 undergraduate and 6,300 graduate students. From the statue of Dr. Seuss in front of the architecturally unique Geisel Library to the 287 million pixel HIPerSpace high-resolution display wall at the California Institute for Telecommunications and Information Technology, UCSD is a jewel of imagination and innovation in the crown of the University of California system. Like most organizations in the age of the digital economy, UCSD needs all the visibility it can get. The visibility is essential to keep track of all the devices on the network, track the variations in the devices, and keep up to date on how the devices are being utilized and secured. The University has Infoblox DDI, which provides a single pane of glass for viewing the network, but Harris needed an even deeper dive into network discovery. Infoblox NetMRI met that requirement. The network team routinely sends logs to Splunk and to a variety of campus databases, and pushes data back to Infoblox for management and automation, and there are eight BIND servers on campus getting zone transfers from the primary Infoblox server. This integrated view with other elements of the network not only makes the overall network more intelligent, but also ensures that the data available is utilized to take effective and immediate actions. DNS Firewall detects and contains malware and automatically adapts to evolving threats, effectively preventing campus users from frequenting dangerous sites. For campus members who need unrestricted access for research purposes, Harris’s team provides opt-out servers. Operational efficiency is just as important in the world of higher education as it is in the world of business—maybe more important. 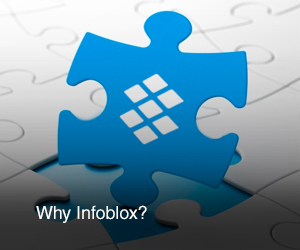 Harris explains the positive impact of Infoblox IPAM on one key role in her organization. “I had one programmer who was developing our kitchen-sink in-house IPAM tool,” she says, “and he was spending 40 percent of his time adding new features that people requested, handling new import formats, or adding new data sources.” She points out that his time was needed for more strategic initiatives. With a feature-rich, automated Infoblox IPAM solution in place, this key resource can now make a more strategic contribution to the team. She also mentions the operational benefits of running Infoblox over running straight BIND and DHCP. “We like the failover. I like the Infoblox Grid™ model. I like having multiple servers running on the Grid, and I like the GUI sitting on top of those services because it means that administrators don’t have to know all the complexities of creating configuration files. That level of abstraction has reduced the effort engineers expend to make updates.” In addition, rolling updates allow the IT team to keep servers and appliances up to date easily without a lot of support overhead. University network teams typically operate more like Internet service providers than network management centers, and their customers—research centers, labs, departments, foundations—are full of independent thinkers and creators who want control over their own zones. Making their networks more intelligent and responsive to the changing needs of the university aligns well with the mission of the university to impart knowledge and intelligence to its students. “Delegation of authority is very important in our support model,” Harris says. “We delegate authority for IPv4 and IPv6 networks to our system administrators, for instance, and Infoblox makes that easy to do.” The end result is a satisfactory user experience for the network’s demanding users.